For the last several decades, the locus of technological power and control within businesses has resided in the IT department. IT has bought and managed the technology that people use on their desks, as well as hardware and software that drives today’s data centers, and enables connections to and services within the cloud. The world of IOT (Internet of Things) is set to make dramatic differences not only in the types of devices that connect to the online world and the processes by which businesses operate, but also in moving more of today’s hottest technologies outside the walled garden of IT and into other business departments. 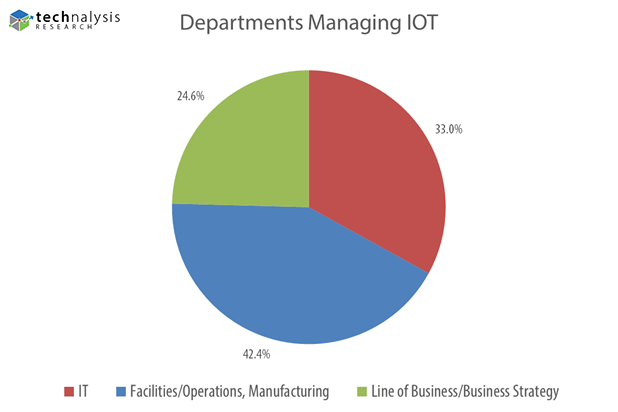 That point comes through dramatically in recent research on Enterprise IOT applications and usage completed by TECHnalysis Research. In an online survey conducted this month of 620 US-based professionals equally split from medium (100-999 employees) and large (1,000+ employees) businesses who have at least some active IOT efforts within their organizations, IT was selected as the second most-common department to be responsible for IOT projects. The top choice? Operations/Facilities/Manufacturing at just over 42%. The survey also revealed that IT is expected to run one third of all IOT projects and Line of Business/Business Strategy groups are expected to control the remaining 25%. The chart below shows the results in graphical form. What’s particularly interesting about this data is that the largest group of respondents (just over 44%) work inside their company’s IT organizations. In other words, even IT folks are acknowledging that when it comes to IOT, it’s likely that other departments within their businesses will be tasked with managing these important new technology-based initiatives. In fact, according to the data, two-thirds of all IOT initiatives will be managed outside of IT. On the one hand, this segmentation makes sense. After all, many of the processes, products and business procedures that are expected to benefit from IOT-driven intelligence and controls fall into these other departments. So, it’s logical to put these organizations in charge of projects that directly impact them. But let’s be clear. The implications of this shift are profound. Moving control of key technologies outside of IT could have a seismic level impact on many of today’s organizations. Given the increasingly important role that technology now plays in virtually every department of every business, it’s arguably past time to spread the control and management of that technology across a wider part of the business. Still, that’s a big hit to today’s status quo. Plus, these changes will do more than just change the role and status of IT—they could influence the overall structure of the business. Departments and individuals that may not have previously had a seat at the company’s strategic planning table are likely to find themselves being invited into the inner sanctum. Frankly, these kinds of changes could also lead to a host of internal power struggles within some businesses. Another impact is that critical business intelligence is going to start being created outside of IT. As a result, IT is going to have to figure out how to work in new and different ways with these departments, as well as develop information architectures and processes that take these data sources into account. On top of that, companies and suppliers who are (and will be) selling the hardware, software and services that make up IOT solutions will have to start thinking and acting much differently when it comes to partnering with their customers. Many IT vendors have little or no insight or contacts into these non-IT departments within their customer base, so there’s going to need to be a lot of legwork done in order to start finding these “new” customers. In addition, the means by which these IT vendors market and message their offerings is going to have to change, as will their overall means of doing business. In particular, the need for even more specialized and focused knowledge about each customer’s business and how IOT can potentially drive benefits that are specific to that business is going to be essential for success. The world of IOT opens up a lot of exciting technological possibilities for businesses around the world, but it’s likely the structural and organizational changes it engenders that will be the longest lasting.